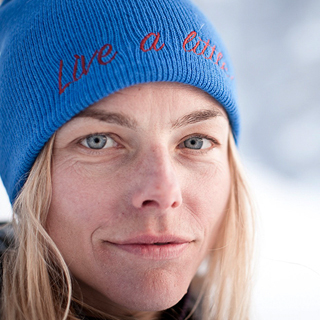 Born and raised in Austria, Bibi started skiing and riding off-piste at the age of 8. After studying agricultural engineering in Vienna, Paris and Costa Rica, Bibi moved to Innsbruck where she could dedicate most of her time to exploring the mountains. Meanwhile, she became a physiotherapist and built up a successful training and therapy center. She enjoys this line of work because it allows her to help others by sharing her personal training experience, and it provides enough freedom so she can still spend time outdoors snowboarding, touring, mountain biking and surfing with her husband, Mitch Tölderer, and their 1-year-old daughter, Lilith, who already likes to join them on adventures.